Sustainable Organic Integrated Livelihoods (SOIL) is a US 501c3 non-profit organization dedicated to protecting soil resources, empowering communities, and transforming wastes into resources in Haiti. We believe that the path to sustainability is through transformation, of both disempowered people and discarded materials, turning apathy and pollution into valuable resources. Since 2006, SOIL has been working in some of the poorest areas in Haiti to facilitate the community-identified priority of ecological sanitation (EcoSan), where human wastes are converted into valuable compost. 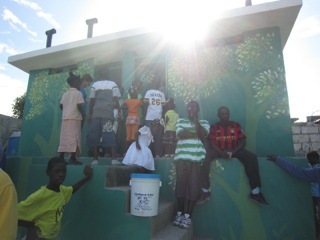 EcoSan simultaneously tackles some of Haiti’s toughest challenges: providing improved sanitation to thousands of people who would otherwise have no access to a toilet and producing a renewable supply of compost critical for agriculture and reforestation. Since building Haiti’s first EcoSan toilet in 2006 and Haiti’s first urban waste treatment site in 2009, SOIL has gone on to become one of most respected sanitation providers in Haiti with toilets and waste treatment facilities around the country, strong partnerships with the non-profit, business, and government sectors, and an information-sharing and educational program that has helped increase the use of EcoSan around the country and, by positive example, globally. By designing, testing, and creating replicable models for the cost-effective provision of sustainable sanitation solutions, SOIL aims to help Haiti to achieve 100% sanitation coverage and to provide viable blueprint for scaling up these innovations internationally. Over 60% of the world’s population has no access to a toilet and, as a result, waterborne disease is one of the leading causes of death in children under the age of 5 in developing countries. While aquatic ecosystems become increasingly polluted with nutrients from human waste, the Earth’s soils exhibit rapidly declining fertility, reducing agricultural production and leading to poverty and malnutrition. Nowhere is this cycle of poor sanitation, environmental degradation, and poverty more evident than in Haiti, where the majority of the population lacks access to a toilet, soil fertility has declined 20% in the last decade, over 98% of the mountainsides have been deforested, and preventable waterborne diseases are common. By producing valuable compost for resale and by providing complete sanitation (toilets and waste treatment) on an extremely limited budget, SOIL’s simple ecological sanitation systems have the potential to significantly reduce the costs of providing sanitation services in Haiti and to provide viable business opportunities for sanitation-sector entrepreneurs interested in taking these innovations to scale across the country and globally. SOIL currently transforms over 5,000 gallons of human waste into compost on a weekly basis with approximately 8,000 people currently accessing SOIL-managed EcoSan toilets. Over 800 people from more over 50 countries have downloaded The SOIL Guide to EcoSan and more than 1,000 people have participated in SOIL educational activities. Watch a film EEMP made about SOIL here. SOIL won the Land for Life award, organised by the UNCCD, in 2012. Please join us on Facebook and Twitter (@SOILhaiti).